Here’s an article taken from a well respected law firm that has done cases where individuals have slipped on wet floors without a wet floor sign present. The situation follows: A situation involving a wet floor with NO wet floor sign ended up in a lawsuit being filed in Jefferson County. The lawsuit, as reported by the Southeast Texas Record, has been file against an O’Reilly Auto Parts store. The lawsuit in Jefferson County alleges that there was a spill at the O’Reilly’s store and that it was not market. The plaintiff fell on a liquid that was not marked. The lawsuit is claiming damages for pain and lost wages, mental anguish, alleged past and future medical expenses and court costs, according to the article. This lawsuit has much in common with others of its kind in terms of what damages are being sought for and why they’re being sought in the first place. Negligence can be taken to mean not taking reasonable precautions to protect someone’s safety and causing them to come to harm because of it. The lawsuit alleges that not marking the wet floor led to the plaintiff’s fall. The lawsuit also alleges that the establishment failed to inspect and maintain its premises. This is a form of negligence in that the store owner isn’t taking the precaution of making sure that the floors aren’t wet in the first place. This alleged negligence is said to be a cause of the accidental fall, as well. Mental anguish and pain are frequently added on to the damages being sought but they can be hard to quantify. A lawyer can help their client to come up with a reasonable figure for this amount. Lost wages can be calculated, obviously, so they are one of the easier areas of the lawsuit to figure out. Past medical bills are easy to calculate but projecting future medical expenses can be trickier. Lawyers have to be good enough at what they do to come up with realistic numbers for items such as these, which maximizes their client’s chances of winning. If you’ve been injured due to slip and fall that occurred in a commercial establishment, you may want to consider talking to an attorney. If the situation involved a slip hazard that was not known and/or not flagged by the premises owner, you should definitely talk to a good attorney. Premises owners are required to take reasonable measure to keep their properties safe. If you’ve been injured because a property owner failed in this regard, contacting an attorney may be the first step in getting compensation. There was clearly no wet floor sign. 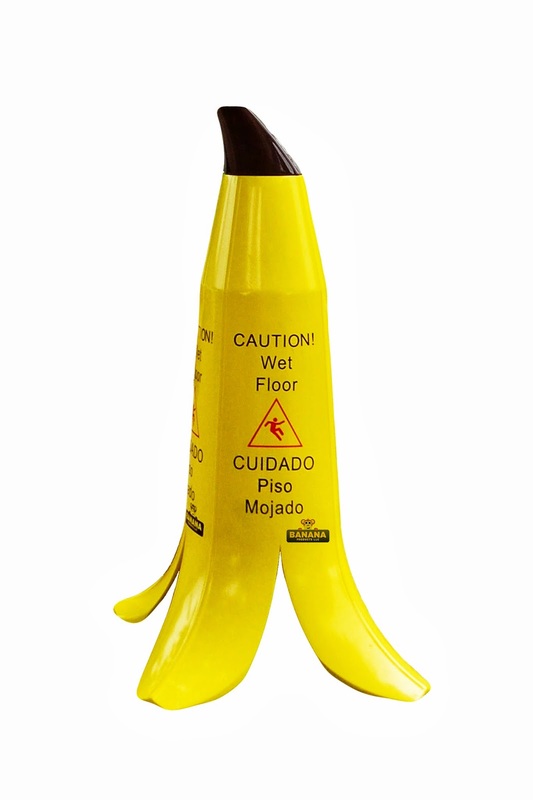 Wet floor no sign so get yourself a Banana Cone™.